question and they’ll provide the answer. For example, if I ask, “Will it rain tomorrow?” the virtual assistant may respond with, “There is an 80% chance for rain tomorrow.” While these virtual assistants most commonly exist within mobile devices, Amazon has recently introduced its own cylinder-shaped version called Amazon Echo, which stands at 9.25 inches high. To install, simply connect it to your home Wi-Fi network and you’ll be guided through setup with the free companion app available on Fire OS and Android, plus desktop and iOS browsers. 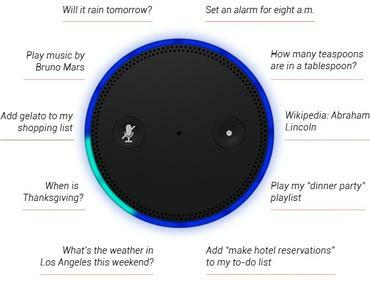 Once it is set up, Echo begins working as soon as you say the wake word, “Alexa.” “Amazon” also serves as a wake word, and in the future Amazon may add more wake words for users to choose from. voice recognition technology with seven microphones that can hear you from any direction. With its enhanced noise cancellation, Echo can hear you ask a question even if it’s playing music. Echo is connected to the cloud, running on Amazon Web Services so it continually learns and adds more functionality over time. The more you use Echo, the more it adapts to your speech patterns, vocabulary, and personal preferences. Music: listen to your Amazon Music Library, Prime Music, TuneIn, iHeartRadio, or stream your favorite music from your phone or tablet via Bluetooth with services like Spotify, iTunes, and Pandora. News, weather, information: hear the most recent weather forecasts and news stories from a variety of sources including local radio stations, NPR, and ESPN from TuneIn. Alarms, timers, lists: Echo helps you stay on time and stay organized with voice-controlled alarms, timers, shopping and to-do lists. Questions and answers: get information from Wikipedia, definitions, answers to common questions and more. 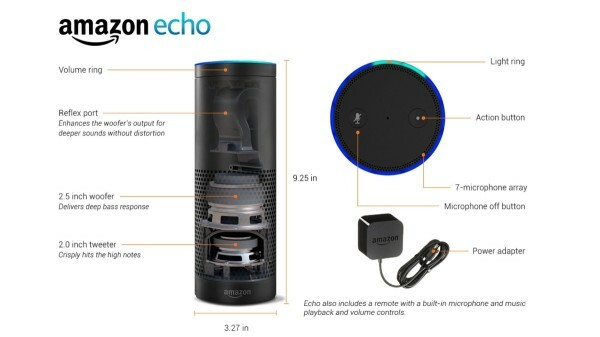 Because it towers at 9.25 inches, Echo isn’t exactly portable. However, with its free companion app, you can stay connected and manage your alarms, music, shopping lists and more anywhere you go. Then upon returning home, you have your very own virtual personal assistant ready to help you with whatever you need. Amazon hasn’t released a launch date or even a strategy for its newest toy, Amazon Echo, but it will be available for $199 (or $99 if you’re an Amazon Prime member.) Because it has not been released, purchasing Echo is through invitation only.